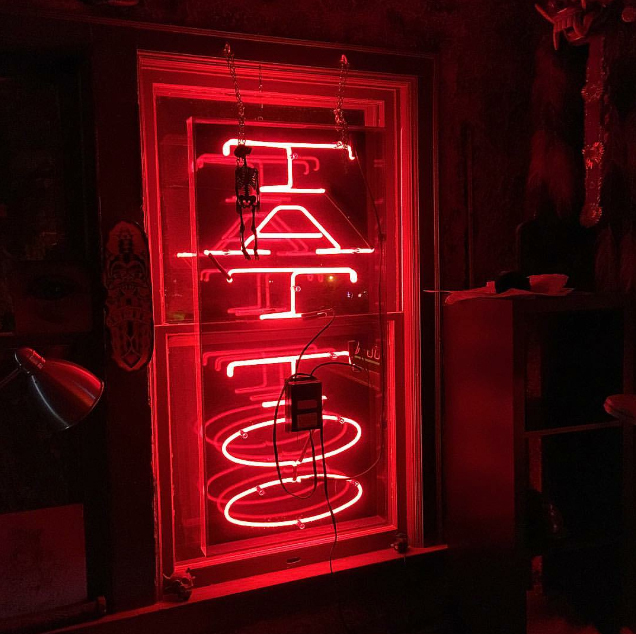 An infinite number of winters before Uptown Tattoo was created there was only the Great Abyss, a gorge of unfathomable depth. The abyss of emptiness was called Minneapolis. From the North, from the land of frost and cold, ice and snow fell into the Abyss. From the South, from the land of fire and heat, burning rivers flowed into the deep. After an eternity of time the ice and the fire came within of each other, and when Nic struck sparks against the ice, the primordial goat came into being. Then also Jon, the first ice-giant, was born. From his armpit, without the aid of a woman, Jon gave birth to many giants. Foot was coupled with foot, and Tom, a son with many heads was born. Out of the salty ice the primordial goat licked a man with beautiful features. His name was Brandon, the born one. It is from Them that all the Gods are descended- Zack and Dan. And after them the Demi Gods Chris and Steven, hungry for their moment as they lived in the night with no stars. Finally Jeff, child of the earth, his tears are the herald of the coming of the goat beast. There was no earth nor sky, but under the soil the World Tree, UPTOWN TATTOO, pushed forth its roots- permeating the universe with her spawn, becoming entrenched in the fabric of her existence.